Limited Warranty, Free from manufacturing defects. This DEWALT DWHT10313 folding pocket knife delivers multifunctional performance on the jobsite or in the outdoors. Its high carbon, stainless steel blade withstands heavy use and the combination cutting edge includes serrations great for cutting rope or twine. An integrated liner lock mechanism holds the blade in the open position safely and securely. 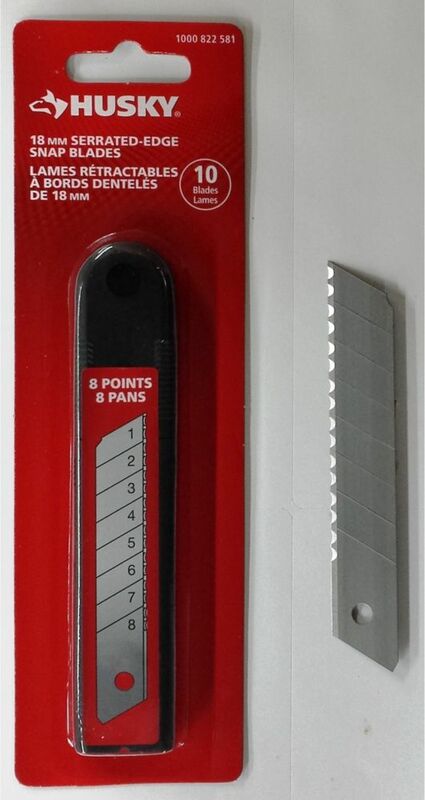 18mm serrated snap blades - 10 pack Husky Serrated blades last longer than standard single edge blades by engaging multiple cutting edges simultaneously, extending the cutting life of the blade. Less blade changes saves you time. The precision honed heavy duty blades fit most standard utility knives.